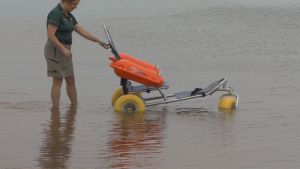 Going to the beach just got easier for Prince Edward Islanders and visitors with mobility issues, thanks to some new additions at the P.E.I. National Park. 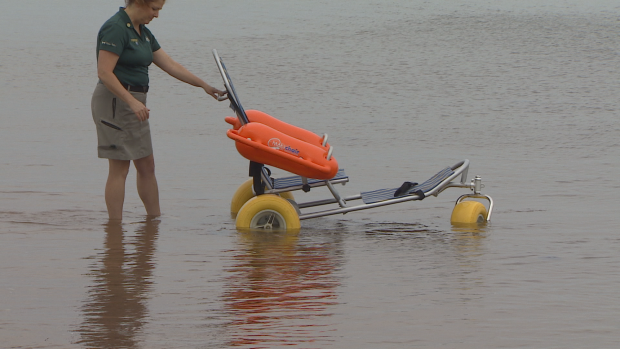 This beach wheelchair actually goes in the water. It costs about $2,000 USD. (Randy McAndrew/CBC)l Park. Parks Canada has installed new accessibility mats at Stanhope Beach, along with two kinds of specially-designed beach wheelchairs. “It’s amazing, it’s a hard feeling to explain,” said Daniel Savoie, of Chelton Beach, P.E.I.